So, our trail building adventures got off to a less than punctual start this decade. We were supposed to be meeting at Swinnertons at 10am, and I woke up…10.15am. Oh dear. Checked the Chase Trails forum for details where the digging would be taking place, and somebody had handily provided a postcode for the nearest parking. So, off we went, GPS at the ready. Our GPS is occasionally set to ‘Lucien’, normally when Mr Toast likes to torment me. Lucien delivers directions in the style of an over-enthusiastic American gameshow host, and insists on calling roundabouts and ring roads ‘traffic circles’. In fact, watch that episode of Red Dwarf, where Holly restores her IQ at the expense of her lifespan. The Talkie Toaster and Lucien went to the same finishing school. So generally, the GPS is set to Simon. Simon sounds like a slightly snide butler, but at least he doesn’t sound obnoxiously cheery. Unfortunately, on Sunday, the ever reliable Simon failed us. The GPS directed us through Upper Longdon, then up through Stile Cop. He said we had two miles to go…then, rather unexpectedly, demanded “In nine hundred yards, make a U-Turn”. Er, excuse me? “In two hundred yards, make a U-Turn. Make a U-Turn”. Slightly bemused, we found somewhere to turn, and headed back up. Simon, bless him, was then quite insistent that we should take the bridleway through the Special Events Area. Ignoring his increasingly demented demands – honestly, I swear he was starting to get a bit Skynet – we looked at the GPS map, and figured out how to make it there ourselves. As we got onto the A460, Simon suddenly realised his mistake, and calculated a route that didn’t involve off-roading a Nissan Micra through the forest. BIT LATE NOW, MATEY. So, we arrived late, missing lunch (D’OH), and started on our Big Build…afternoon. I was thoroughly impressed with the turnout – given that it was a) below freezing, and b) just after New Year, I expected the turnout to be a bit sparse. But no, over 60 people were there, braving the cold, and had already dug a sizeable length of trail. After a quick venture up and down the track to find some tools, we starting digging near the trail exit. Here, Martin had found the best tool – the chainsaw. Conditions weren’t actually too bad – the ground wasn’t as hard as we were expecting, despite the freezing cold, and it didn’t take too much digging to get to the good stuff. I became distracted by an exceptionally good dog – Leo, a black collie cross…wearing a coat. He looked very dapper. He was trotting around with a disc in his mouth, looking for someone to play with him. How could I not. I threw the disc and VOOM! Off he went! And came back, dropping the disc in front of me and looking at me. This was repeated over and over again, making it rapidly clear that I do indeed throw like a girl, and that border collies never, ever, ever get tired. 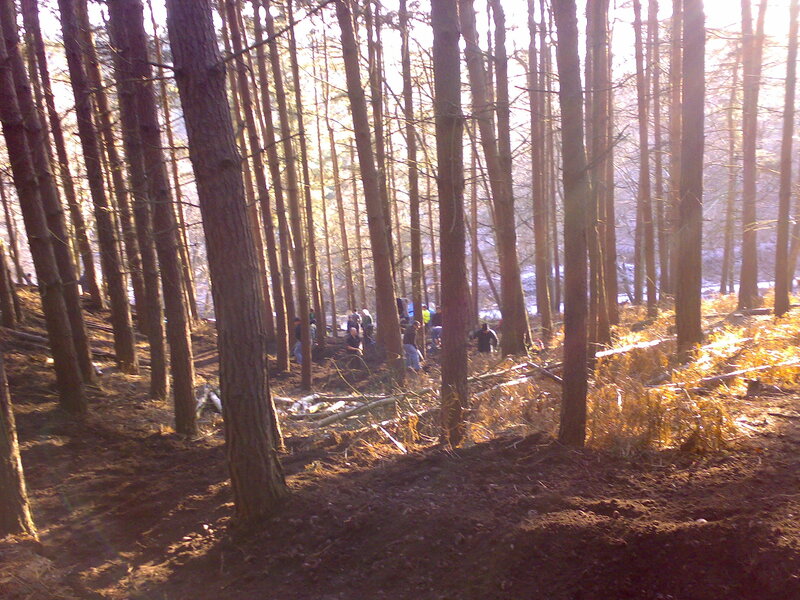 More pictures and information about Sunday’s Big Build Day can be seen on Chase Trail’s blog. 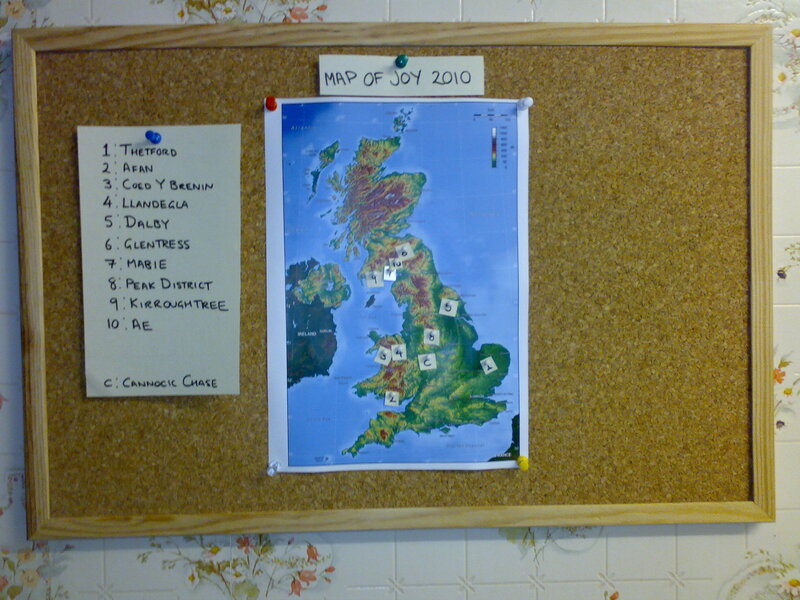 Yes, it’s the 2010 Map of Joy! All the 2009 mementos have been removed, the black ‘Done’ pins replaced with white ones, and it’s now ripe to record a new year’s worth of adventures. It’s fairly similar to last year’s, with a couple of additions and changes. 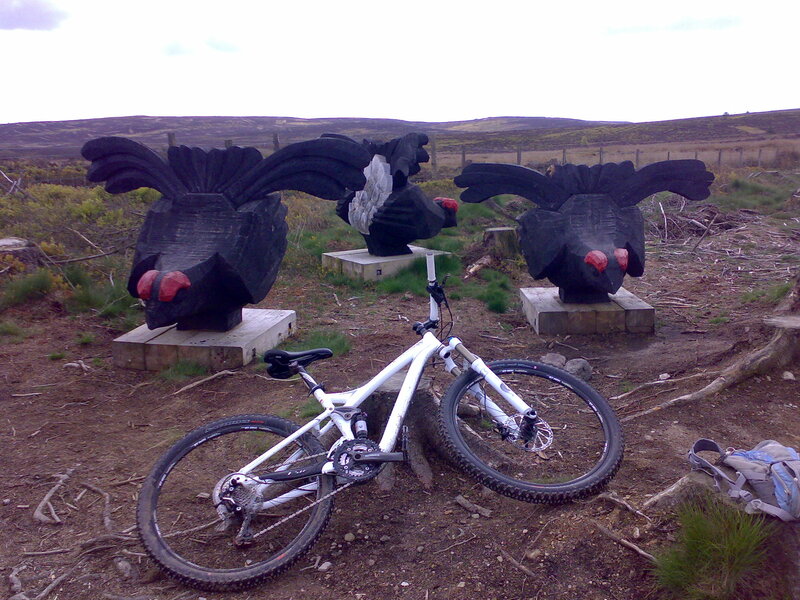 Main additions are the 7Stanes trail centres – Kirroughtree, Mabie and Ae. The cunning plan is that this year we’re going to spend TWO weeks in Scotland – one around the south-west border, probably near Mabie. Hopefully we’ll have time to hit Dalbeattie again, but we’re not counting on it! The second will be our usual anniversary trip to Glentress in July. Huzzah! 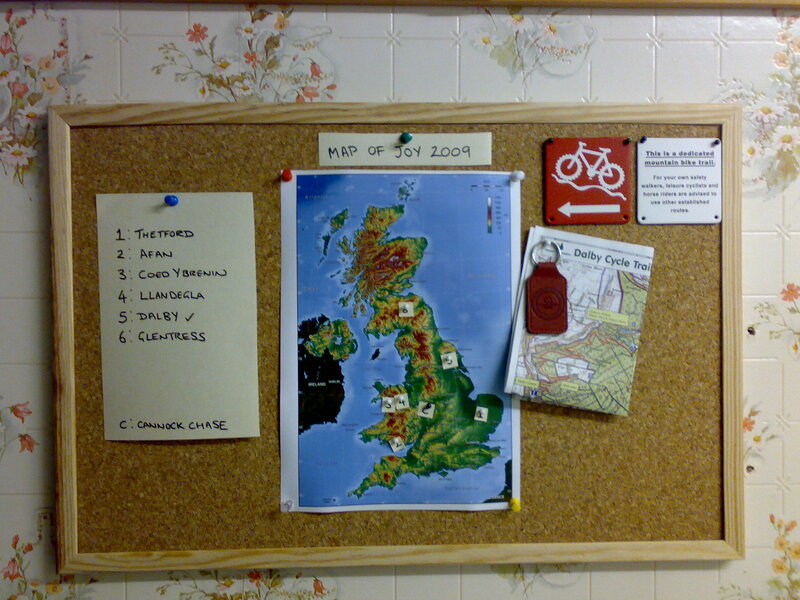 Thetford, Afan and Coed-Y-Brenin are still on the map, hopefully we’ll actually ride them this year! I’m strangely intrigued by Thetford – it’s a bit lonely in the south-east, and as you can see from the map, looks a bit…flat. It’s not a part of the country I’ve ever been to before, so I’ll be interested to see what it has to offer. 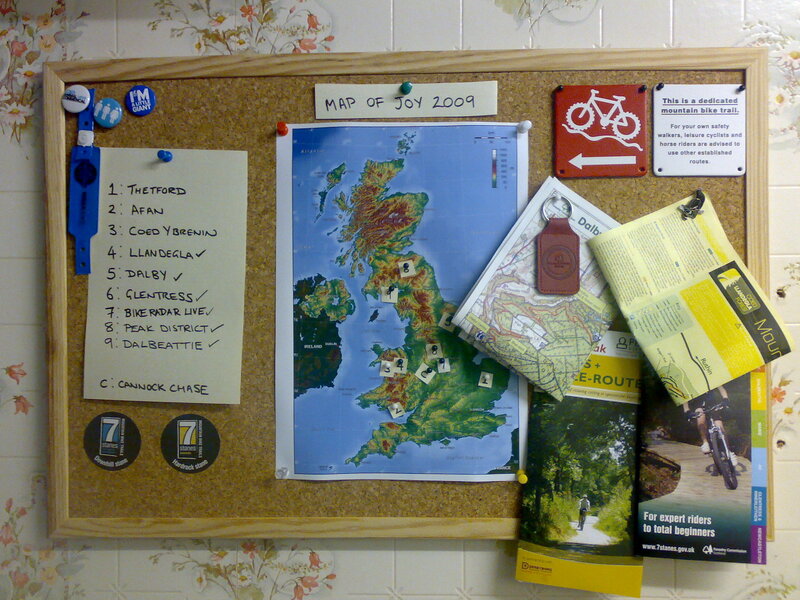 Tomorrow will be our first biking related ‘engagement’ of 2010 – the first ‘Big Build Day’ of the year! So, you can probably expect an update from that over the next couple of days…once I’ve thawed out! Ah, 2009. The last year of the ‘noughties’, and the last year of me being in my twenties. Alas, there are still no hoverboards or flying cars, but it wasn’t too bad overall. Whilst at the Bike Radar demo day, entranced by a border terrier, I signed up and became a member of Chase Trails. 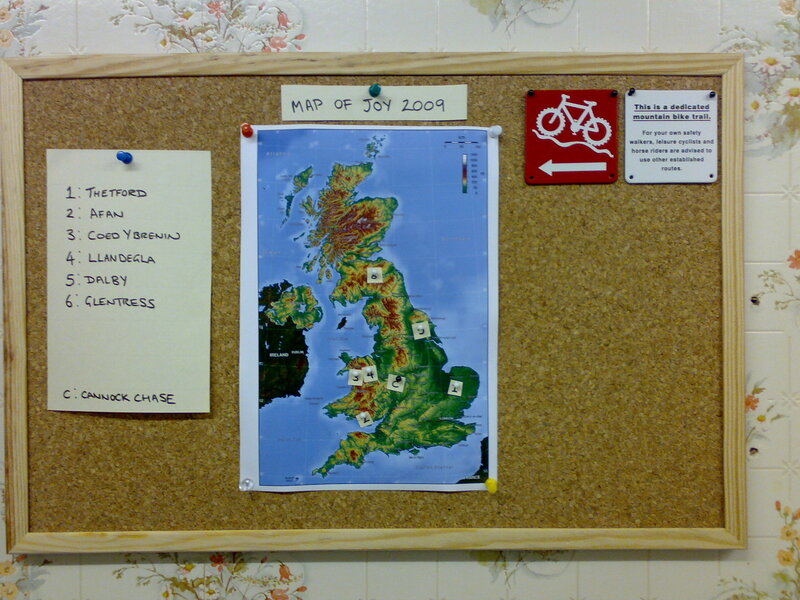 In February I created the ‘Map of Joy’, pinpointing places across the UK we wanted to visit for biking purposes. The first addition to the Map of Joy was a pair of rather lovely mini-coasters from Chase Trails, and Cannock Chase was set up as home base. The first sojourn to non-Cannocky climes was to Dalby, when we visited the Toast-in-Laws. I ventured onto the Dalby red route for the first time, and thoroughly enjoyed it – although I chickened out on some of the downhill drops. The most depressing of the rear-hub instances was after making the 2.5 hour drive to Llandegla. Still, at least the Professor and I had a good time whilst Mr Toast sat glumly in the café for a couple of hours. In May, we helped marshal the Nice Price Special at Cannock Chase. The weather was actually pretty nice on the day, but had been spectacularly grim in the days before hand, leaving the course a slidy mudbath – so, pretty much a traditional MTB event! The end of May saw the first ever Bike Radar Live at Donington. It wasn’t originally on the Map of Joy, but it got added with various bits of tat. It was a great weekend – good atmosphere, great weather, and there’s something distinctly charming about flying around Donington race track on a tandem and folding bike. 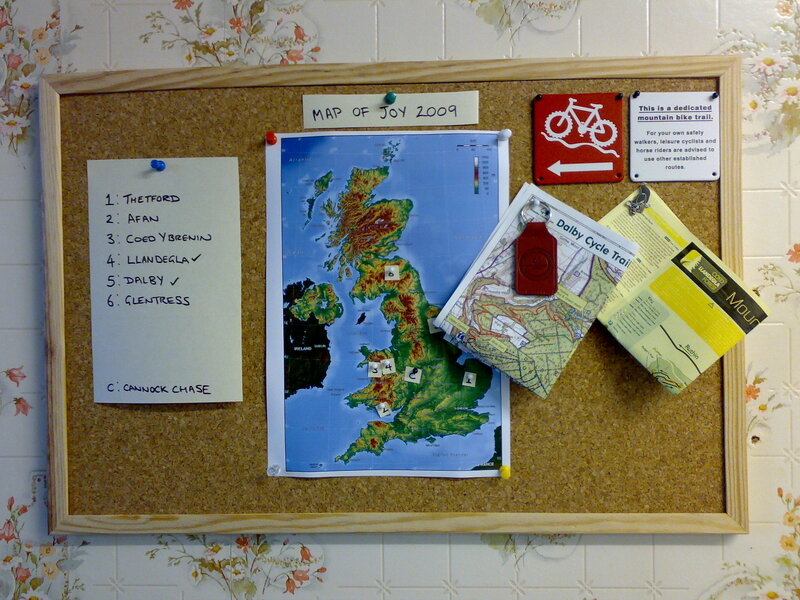 It’s a shame that we won’t be going to Bike Radar 2010, but unfortunately it a) clashes with our anniversary, so we’ll be in Scotland, and b) is in Kent. Kent! I mean, really? Kent? June saw me venture to the Peak District. As I was holidaying with my mother, it meant that my bike adventures would be strictly solo. Well, apart from that day when I hired a wheelchair bike and strapped my mother to the front. Other than that, it was adventuring around Castleton, going up Mam-Tor, and generally admiring the views. In July, Mr Toast and I celebrated our first wedding anniversary. 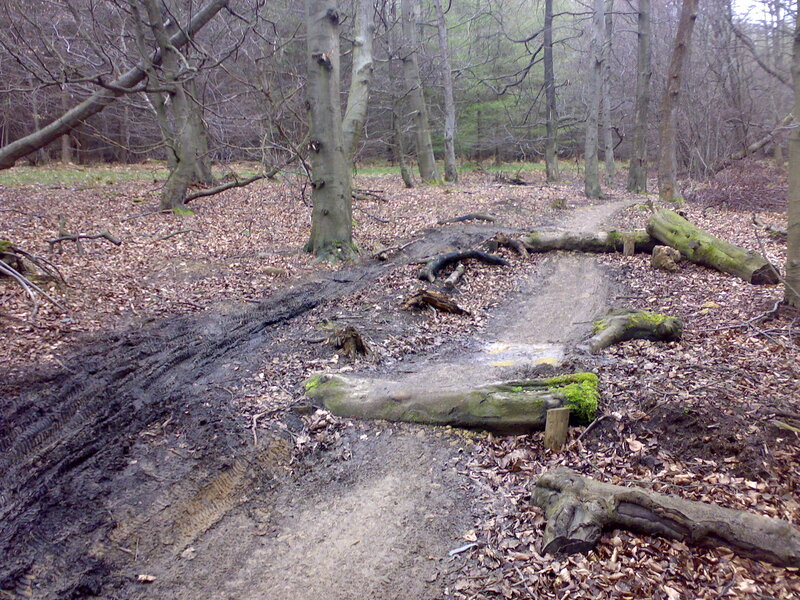 And what better way to celebrate it than throwing ourselves around some of the finest trails in Britain! 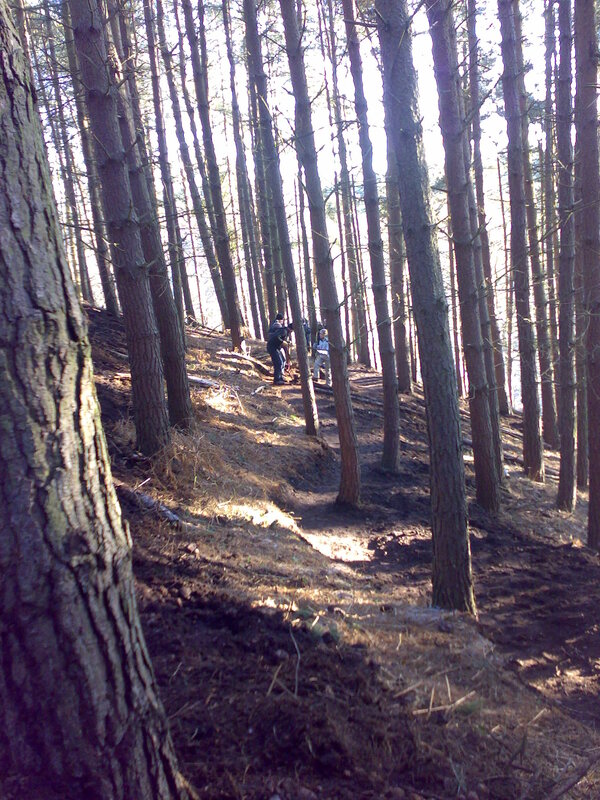 We revisited Glentress, went around both the blue and red routes at Dalbeattie, and flirted briefly with Innerleithen. If you count ‘flirting’ as ‘crying whilst carrying your bike’. 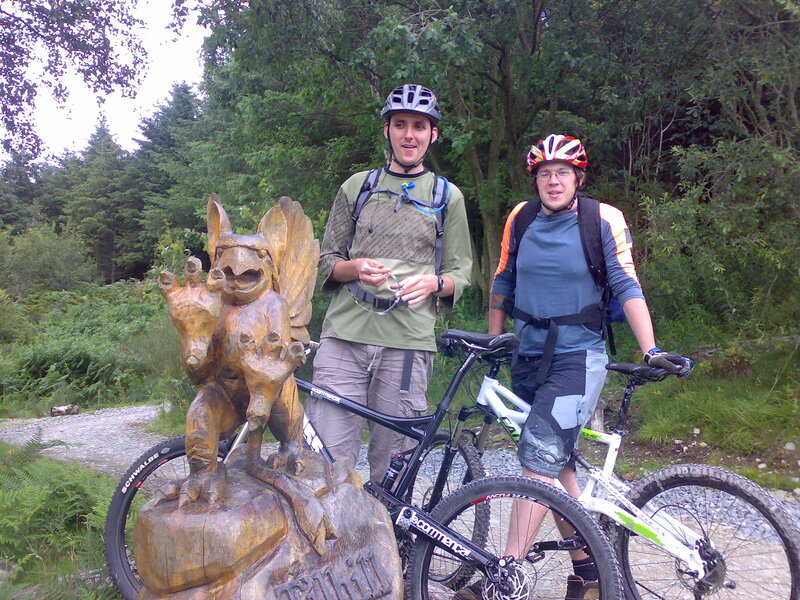 At the end of July, we revisted Llandegla – Mr Toast had a fully functioning bike at this point! Also along for the ride was Sir Jaggy, on his newly acquired Cannondale Prophet. A seasoned road rider, Jaggy had limited off-road experience, but fortunately a more than healthy level of competitiveness meant that he threw himself into it with great gusto. He also threw himself into trees, but we don’t talk about that. I also finally managed to ride all of the new rock features on FtD, and get a lap time of under an hour for the first time. 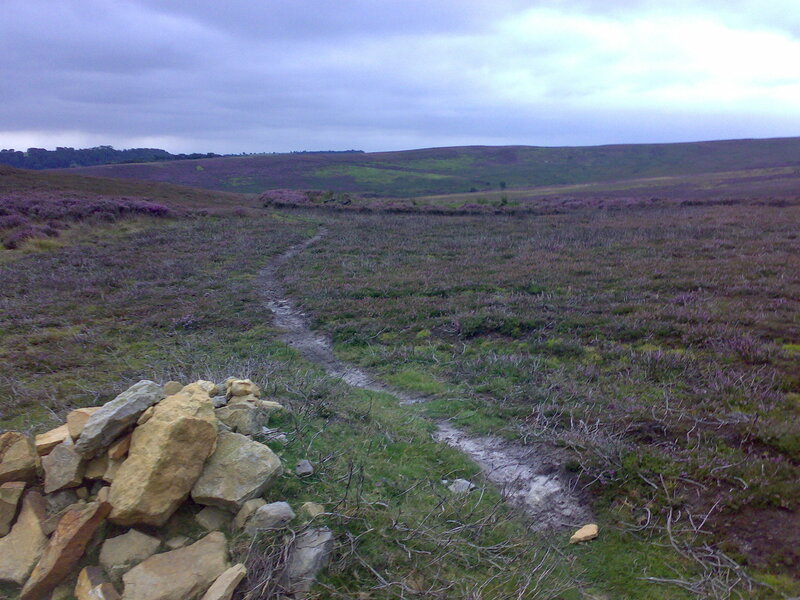 We also ventured outside of the trail centres when we went Oop North again, riding across moorland and getting chased by pheasants. October was notable. Why? Because it was the start of THE LURGY that I’ve now had for three months. Fortunately the only symptoms I have now is a persistent cough. Could be worse, eh? The remainder of the year has been me battling to get out at the weekends despite the cold – at the moment, I’m actually giving biking a couple of week’s break in the hope that the cough will bugger off. 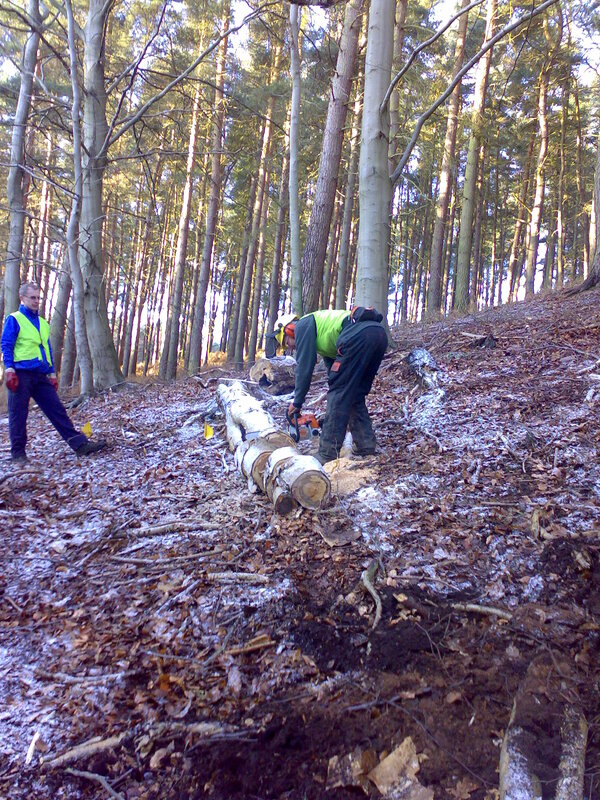 We helped out with a couple of the Big Build Days at Cannock Chase throughout the year, hopefully we’ll be able to get a bit more involved next year. Really looking forward to Phase II, which will hopefully be opened Easter next year!